Last time I checked in with Achim Freyer, I was seeing his wild Ring in Los Angeles. 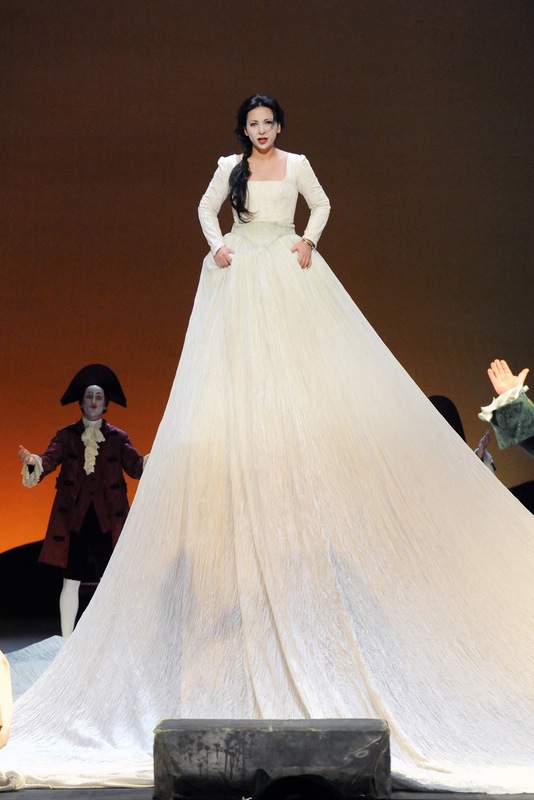 My enthusiastic and prolific blogging on this topic earned me a high place in English-language Achim Freyer Google rankings (a competitive field, to be sure), so when I saw his Cenerentola was approaching at the Volksoper, I knew I had to defend my beat. Luckily, the feel of this Cenerentola, first staged at the Volksoper in 1997, is quite different from his Ring. But I liked this one a lot too! It’s colorful and fun, and the cast has a few real winners. Freyer’s style is stiff and surreal, Robert Wilson meets Brecht. Odd, long-held poses, mechanical movements, clown makeup, and giant costumes are de rigueur. But while this is visibly the same style as the Ring, here it’s all in simple fun. The sets are plain solid backdrops with doors while the costumes are giant, colorful, and surreal (the wicked sisters sport conical cotton-candy hair). There are a few spectacular effects, most amusingly the Prince’s many-legged, chorus-powered horse, but mostly the focus is on the characters. Freyer’s blocking is closely attentive to the rhythm and structure of the score. 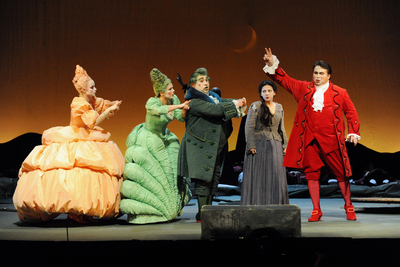 The comic sisters, Don Magnifico (the opera’s version of the wicked step-mother, a wicked step-bass), Dandini (instead of a fairy godmother, Cenerentola gets a fairy god-baritone), and Alidoro bear the brunt of the choreography while Cenerentola and the Prince are allowed to emerge as more naturalistic characters. Ensembles are the most stylized, and sometimes it can be jarring to hear such energetic music performed for such long stretches of visual stillness. But at other points this is used to exceedingly good effect, such as in the opening ensemble, in which Cenerentola is forced to run rapidly between the members of her frozen, demanding family. The execution is generally well-coordinated and thorough (this is a Wiederaufnahme, a revival that promises it rehearsed, honest), though at some points the frozen was not quite as frozen, nor the movements quite as controlled as they could have been. Ah well, pretty good. Blessedly, the Volksoper performs this work in Italian (most of their operas are in German, other exceptions include Tosca and La Traviata). All that patter in German would have been awkward. Andreas Schüller conducted with good ensemble and an excellent performance from the orchestra, but sometimes lacking in an indefinable sparkle. The cast was one of the best I have seen at the Volksoper (I have been there more often than my blogging implies; I don’t like writing negative reviews). 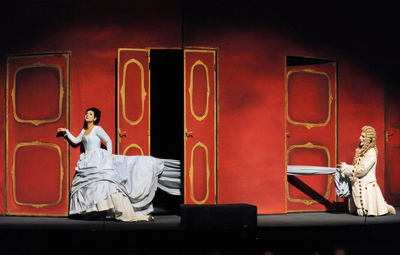 The Volksoper has a great find in Adrineh Simonian’s Angelina (pictured). She got off to a slightly shaky start, but warmed up to a light, well-supported sound with absolutely super coloratura and a great deal of charm and flair, and brought down the house with her rondo. As Don Ramiro, Jörg Schneider (not pictured) was fighting a cold, and while his thin Germanic Mozart tenor has the notes for the role, he seems a bit too austerely detached. Also, and I know this is going to sound mean, he struggles as a tenor with the body of a basso buffo. His illness was a major issue in the second act, and it’s too bad the Volksoper couldn’t have found him a replacement; it must be terrifying to have to go onstage when you’re so out of sorts. The highlight of the supporting roles was Yasushi Hirano’s wonderfully-sung Alidoro, with a warm and even bass-baritone and pinpoint coloratura. Mara Mastalir and Tina Hörhold were an excellent pair as the sisters with clearly-projected voices and some of the most controlled and consistent Freyer moves of the cast. On the other hand, Dominik Königer’s Dandini sounded good in slower music but fudged many of the quicker notes, nor did his high notes always project. Noé Colin sounded somewhat muffled as Don Magnifico, though sounded much better once I escaped the overhang for a better seat in the second half of the opera. This is what the Volksoper should be good at, a fun and fantastical performance of a modest opera. It’s not world-class, but it’s a perfectly delightful evening out. Five performances remain, on 7 14, 17, 20, and 22 February, some with an alternate cast. Couldn't agree more with your conclusion; I really enjoyed it.